The aesthetic appeal of a large rock outcropping overlooking Puget Sound serves as the focal point for the design of this island home. The kitchen, dining room, and living room are enclosed in a glass-walled pavilion abut the rock terrace. An outdoor fireplace compliments the outcropping's natural beauty. The house bridges a small ravine to connect to a bedroom pavilion, which overlooks a private cove. 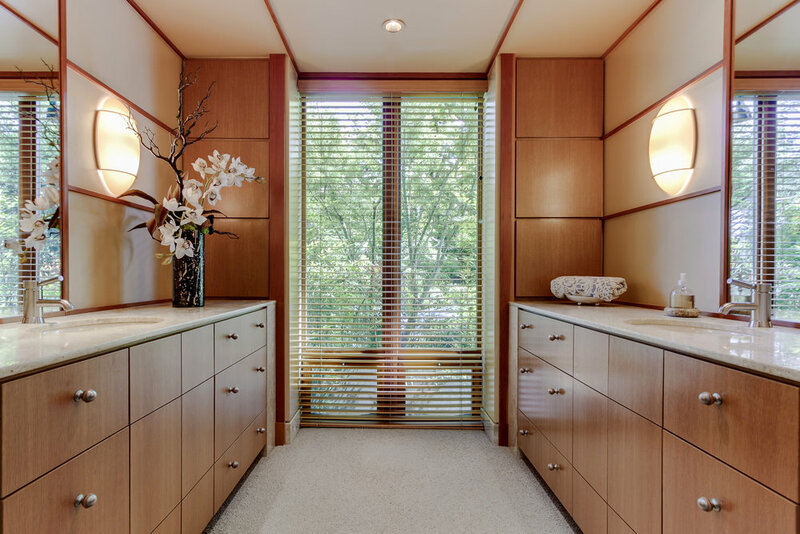 The bridge contains the owner's study and provides well-lit cover for the front entry. The three gabled pavilions fit serenely on the dramatic shoreline and help to define the surrounding outdoor spaces, at the same time providing a strong sense of shelter for activities within the home. This new lakefront home is designed to take advantage of its beautiful low bank site. A raised covered terrace on the lake side, equipped with a large outdoor fireplace and kitchen, provide a delightful connection to the lake and extension of the house. Another terrace to the east provides a more protected and intimate outdoor space for use in wet northwest weather. The home has a main floor for company and living. Bedrooms are above and a basement is below. The glassy facade helps bring in plenty of light and provides views of the water. The strong lines and simple gable forms of an existing farm building on the site inform the aesthetics of this waterfront home. Durable materials such as board and batten siding, brick chimneys and metal roofing emphasize its homey simplicity and graceful strength. The building integrates seamlessly into its waterfront site by a series of terraces and canopied roofs. Visitors experience this by traveling an entry path that creates a sequence of spaces, beginning from the garages, cascading down to the entry vestibule, and then moving alongside the main living areas down to the lakefront dock. Rooms in the home eddy off this main path. The final result is a grounded home of strong character that embraces the land, the lake, and the views. This cozy waterfront remodel incorporates history with modern elegance into a larger permanent home on Flathead Lake. The stacked wood walls of the original 1940’s cabin became the organizing element of the current living spaces, and are left exposed to reveal the building’s history. Additions to the north and south create new bedrooms and bathrooms. A new bay window addition picks up on the angle of the existing stone fireplace and provides for views south across the lake. 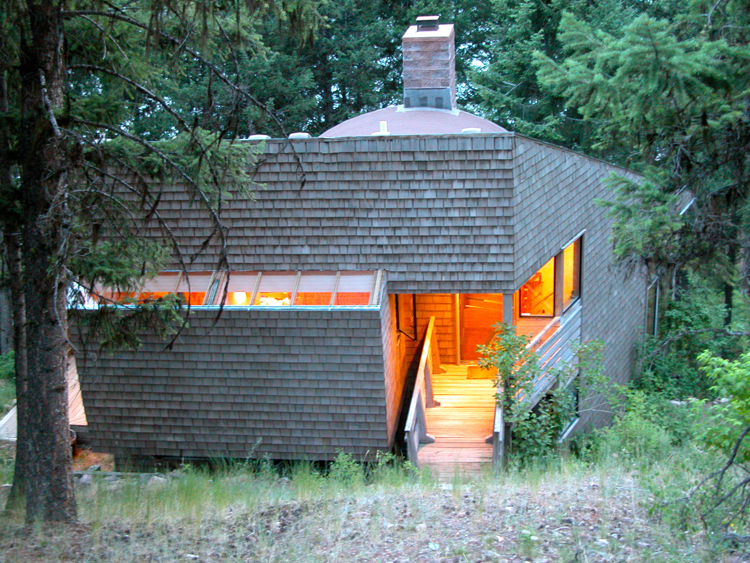 A large shed roof covers the building and allows eastern light into the home, as well as views uphill into the forest. 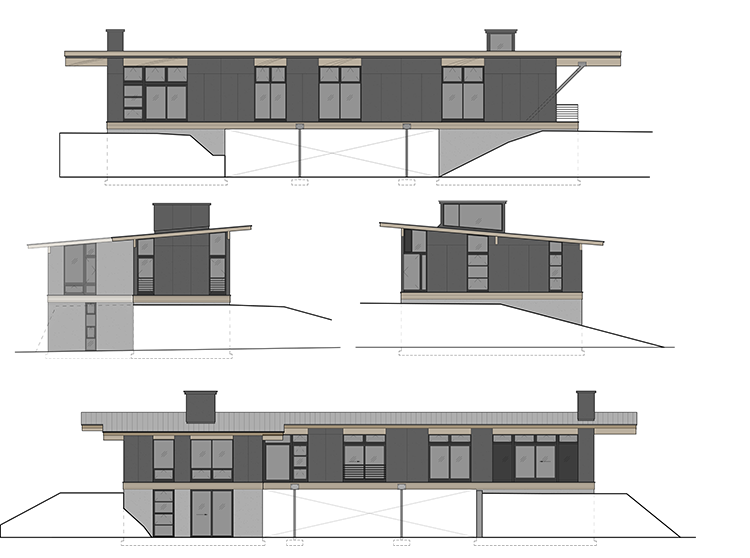 A two story garage uphill of the home provides for storage, parking, and a workspace. This Lake Washington residence was extensively rebuilt, with several tactful decisions transforming it into an elegant waterfront haven. The front window bay organizes the exterior of the home. Behind it the living room is provided a sweeping view of the lake. Raised living room ceilings and skylights create an airy space that draws light deep into the home. Opening previous interior rooms to each other on the main floor created a welcoming, light filled congregating space adjacent to the large and open kitchen. Additional rooms below, including a study with direct access to the waterfront terrace provide more secluded comfort. Resting on Mercer Island shoreline, this home-in-progress captures the beauty of it’s surroundings, with cedar-wood beams and angled roofs that draw an onlookers’ attention towards the view of Lake Washington. Large glass windows draw natural light into the home and expose the waterfront view from inside. Open living and kitchen areas, equipped with a cozy fireplace and quick access to a covered terrace keep the design interconnected. The covered terrace includes both an outdoor dining area and fireplace with views of the lake, and is positioned next to a small garden space. This waterfront home exudes style and comfort. This small cabana and boat house for owners of a waterfront lot provides additional living space and enjoyment of the existing pool and lake shore. The cabana is linear and tucked into the hill, accenting the slope of the landscape. 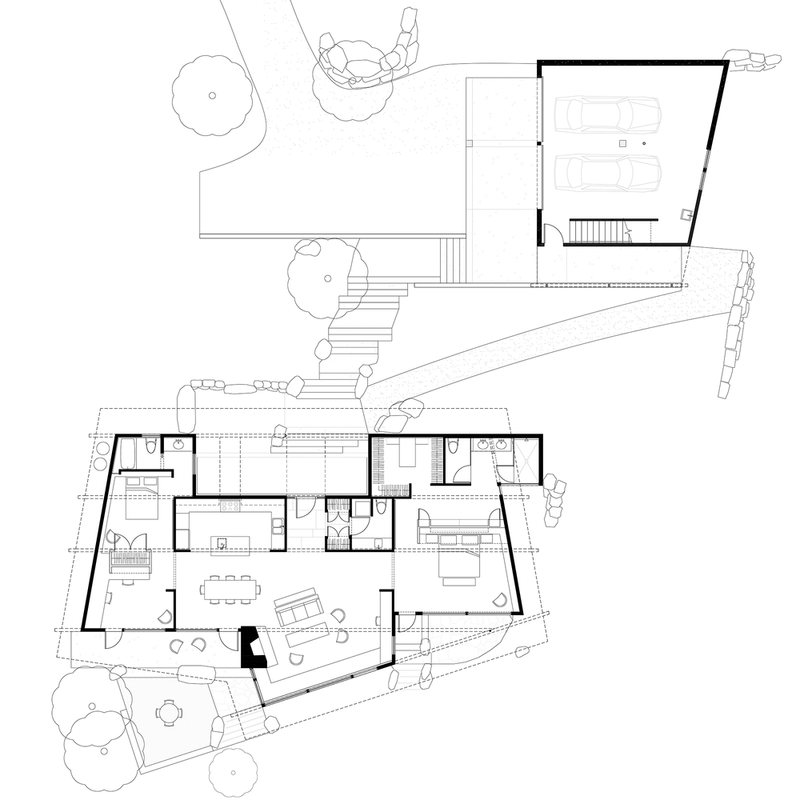 Inside are a bathroom, kitchenette, and a living space which opens directly to a terrace and lawn. Perfect for guests, relaxing, and storage, the cabana instinctively blends glassy object with shoreline. 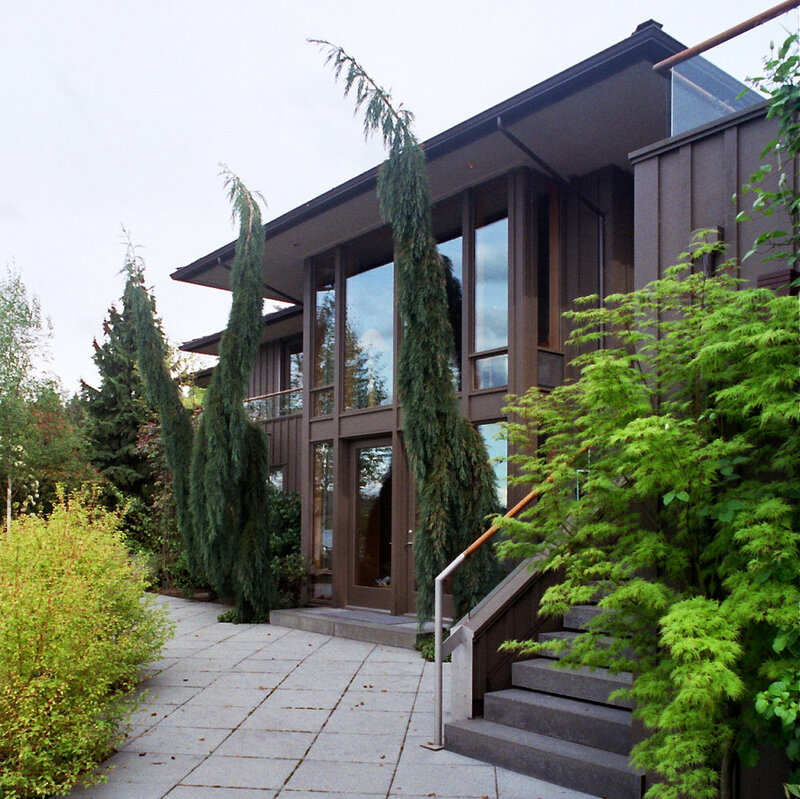 This modern, classic home overlooks Puget Sound from a low bank lot, and takes full advantage of the views and proximity to the shore. 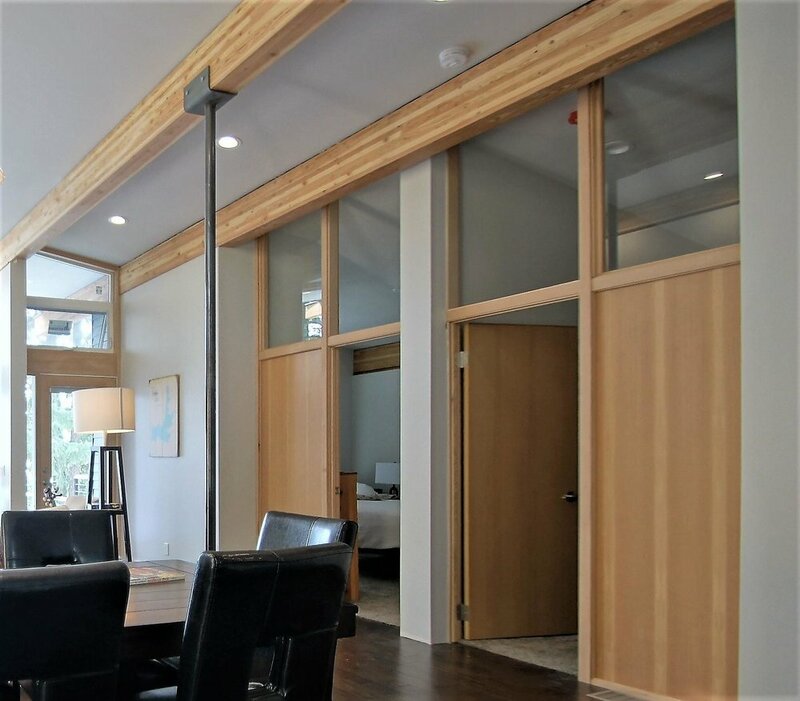 Cedar siding, wood windows and warm materials throughout create an inviting look for this light-filled house. The large, main-level dining room and kitchen can comfortably handle intimate or large gatherings. The dining room becomes even more spacious with sliding doors that open onto a terrace with an outdoor kitchen and a glass canopy that keeps guests dry in inclement weather. The basement features a rec-room and a small theater, with direct access to a terrace and the waterfront lawn. The entry facade includes a concrete garage face and lighter wood-framed bedrooms to one side, with spacious living areas to the left. The main stairway occupies the light-filled transition area between. This Montana summer cabin is positioned on an abandoned logging road overlooking Big Sky Lake. The logging road provided a ready-built terrace as well as a good anchor point to build from. The cabin was designed to allow winter snow to slide underneath the structure and off the roof downhill. 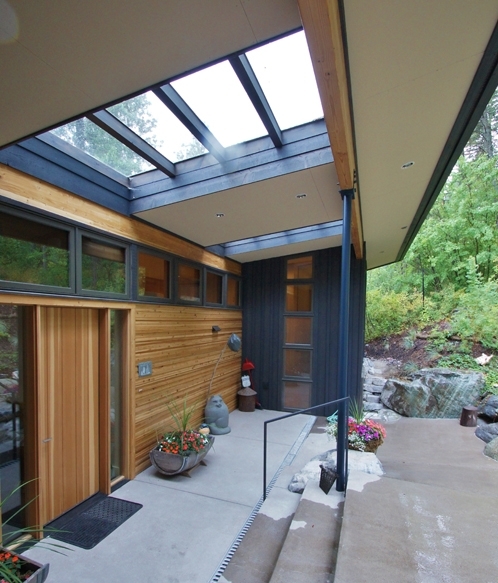 During the summer months, large overhangs help moderate the sun. A projecting deck allows for the excitement of a promontory view. Under a large barrel-vault roof windows brings in light and open up the cabin to the lake and tree-line views. The children's loft bedrooms include a skylight for nighttime star gazing. This extensive remodel utilized some of the original foundation while the rest of the cabin was rebuilt. It was important to keep some of the beloved features of the original design, and so SLA incorporated both an open deck and covered screen terrace, each with views to the lake. A bunkhouse in the back was kept intact as a space for all the kiddos to sleep. The interior of the new cabin features a large and open kitchen, dining, and living space that connects to the terraces. Clerestory windows allow natural light inside, and large windows facing the lake highlight the landscape. The slanted roof of this design allows the cabin to dispel snow build-up, and the cozy fire place and better insulation enable winter usage and enjoyment. Several guest bedrooms allow the owners to include extended family as well as friends in experiencing the beauty of their property.